Polar Bear Expedition Americans in Russia. RPPC. Private Collection. Bottom row: Johnson and ‘Tom’. With their mix of names, I think these four were Americans. 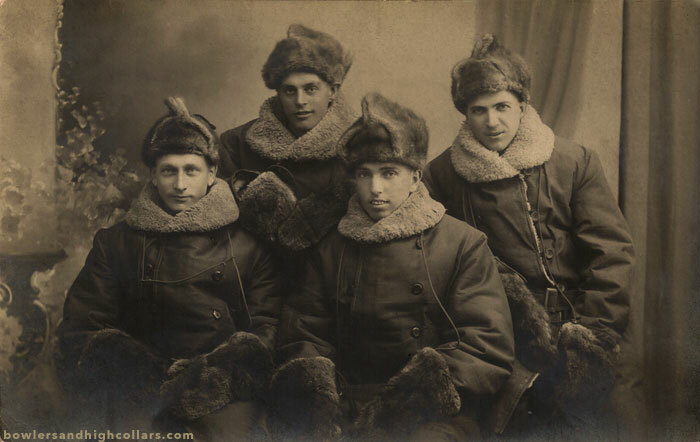 Per the conversation below there’s a good chance these four were of the ‘Polar Bear Expedition’, American infantry soldiers of the 339th Regiment fighting the Bolsheviki in 1918. The wires on the front of the man to the left (Johnson) are probably to hold a backpack in place. They were in a studio but it isn’t hard to imagine the piles of snow outside. 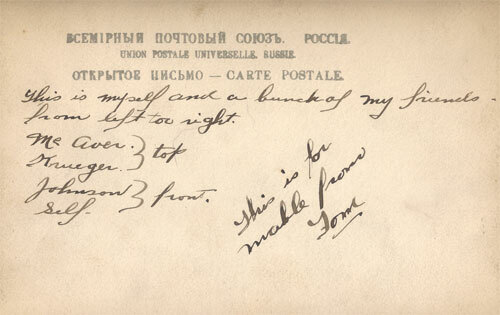 Universal Postal Union of Russia. Interesting also that the only translation on the back is in French. I’ve tried to date this postcard but with no luck. There just aren’t too many from Russia floating around that I’ve seen. My guess is this was taken anywhere between 1910-1920. Here are a few pictures of the soldiers from the book “The History of the American Expedition Fighting the Bolsheviki”, by Joel R. Moore and Harry H. Mead and Lewis E. Jahns. Thank you Mrbflaneur for pointing me in that direction! A sad but revealing tribute to the fallen soldiers of this expedition. This entry was posted on Saturday, June 6th, 2015 at 12:16 am	and tagged with adventurers, Russia, winter coats and posted in Groups, Military, RPPCs. You can follow any responses to this entry through the RSS 2.0 feed. I can’t see any badges, but the United States 366th “Polar Bear” Infantry Regiment was stationed in Northern Russia between 1918 and 1919, supporting White Russian forces during the Russian Civil War, so that could be something worth looking into. You got me on a goose chase here! Thanks for sharing your info. Pictures of that unit are hard to find. I was hoping to find out if those coats are army issued. Good picture! Note they’re all wearing different coats and the picture isn’t as crisp either. Perhaps soldiers were in charge of buying their own coat. This is a picture I should show those Polar Bear memorial people, see what they think. The timeline matches, I think there’s a good possibility these four were stationed there. Interesting book, going through it…but my Kindle app is not putting out the table of content -ugh. So I don’t know what picture you’re talking about. Oh I saw it! Same coat! And the one in the middle too. Nice catch! He’s looking down at a shoe too. Yes, I noticed the shoe. How odd! Is he wearing a fur glove, like your chaps in your photograph, on his left hand? Different gloves but I’ve seen the ‘mitts’ on another picture in the book. This book is actually fascinating to read! I updated the post and gave you credit for pointing me in the right direction. Many thanks!